""Stimulating, informative and highly enjoyable."" 14 & 15 April 2016, Bilbao, Spain. The 2016 edition focussed on big data and innovative approaches to boost performance and optimise O&M strategies. The five sessions covered strategies to extract value from big data, understanding failures and detecting faults, using data for advanced performance modelling, reporting and analysis from operating assets, as well as innovative approaches to operations optimisation, life-extension and decommissioning.During the extended networking breaks, participants were also able to view 37 posters and meet their authors. 1-2 October 2015, Leuven, Belgium. The second edition of EWEA Technical Workshop on Wind Power Forecasting took place in Leuven, Belgium on 1-2 October 2015 at the Leuven Institute for Ireland in Europe. With support schemes for renewables becoming increasingly linked to market dynamics, determining the average power output of a wind farm is not only essential at the outset of a project, but also on a day-to-day basis to determine more precisely trading positions in short-term power markets, as well as to meet increasing balancing responsibilities. This workshop addressed both, the long and short term dimensions of wind power forecasting, which will be crucial for the commercial success for wind power plant developers, owners, aggregators and all financial stakeholders involved, as well as system operators and forecast providers. The proceedings (oral presentations and posters) are available free of charge to all participants and to EWEA members via the Members’ Area (to be uploaded in the near future). If you are not an EWEA member and didn’t attend the event, you still have the possibility to order the proceedings. Please contact Smita Pati ([email protected]) for more information. 2-3 June 2015, Helsinki, Finland. The third edition of EWEA’s technology workshops on wind resource assessment. View the programme, the list of posters, and contact fellow participants through our online networking tool (for attendees only). 9-10 December 2014, Malmö, Sweden. As requested by participants at the first edition in Lyon, France – July, 2012, we returned to the topic of operation assessment two years later in order to debate progress in the field. View the workshop programme and find out about sessions and presenters. Contact fellow participants through our online networking tool (for attendees only). 9-10 December 2014, Malmö, Sweden. Our second workshop on this highly topical issue had common threads running through the different sessions: amplitude modulation (AM/OAM), low-frequency sounds (LFS), sound levels and tones. View the workshop programme and find out about sessions and presenters. Contact fellow participants through our online networking tool (for attendees only). This event launched REserviceS’ ‘Technical and economic recommendations for the design of a European market for grid support services, as well as for future network codes within the Third Liberalisation Package’. It featured lively debates in panels tackling the recommendations from both a technical and a market perspective, and finished with a networking cocktail. Participants explored what variable renewables can do for the grid and how we can make it happen. EWEA’s fifth annual Hungary policy workshop, was organised in association with the Hungarian Wind Industry Association (MSZIT) and the Hungarian Wind Energy Association (MSZET). The workshop presented a number of case studies related to the transmission and the distribution system operators in the Iberian peninsula. The event aimed at putting the REserviceS results from the different case studies in a European perspective. See the programme here. The workshop focused on frequency and voltage support at high share of wind and solar PV and discussed distribution case studies in Germany and in the Mediterranean region. See the programme here. This workshop focused on frequency and voltage support at high shares of wind, with case-studies related to the transmission system. 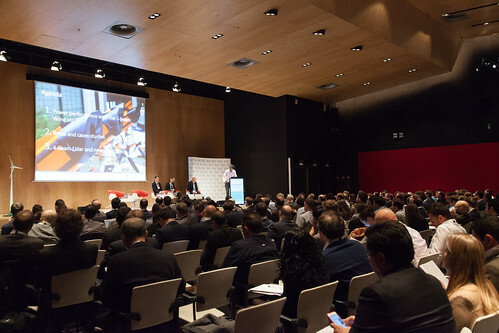 210 specialists attended EWEA’s second technology workshop on resource assessment. The final workshop of the TWENTIES project took place on 11 June at the Thon Hotel EU in Brussels, from 9AM to 2PM. A visit to CORESO’s facilities was possible for interested participants in the afternoon. The TWENTIES Project was coordinated by Red Eléctrica de España, the Spanish Transmission System Operator, and ran from 2010 to 2013. Its aim was to advance the development and deployment of new technologies facilitating the widespread integration of more onshore and offshore wind power into the European electricity system by 2020 and beyond. Proceedings available free of charge.